On November 11, poets Frank Bidart, Sven Birkerts, Eavan Boland, Lucie Brock-Broido, Greg Delanty, Jonathan Galassi, Eamon Grennan, Edward Hirsch, Jane Hirshfield, Yusef Komunyakaa, Paul Muldoon, Atsuro Riley, Tom Sleigh, Tracy K. Smith, Jean Valentine, Anne Waldman, and Kevin Young, and novelist Colm Tóibín will gather at Cooper Union for a public tribute to the beloved and world-renowned poet Seamus Heaney, who passed away on August 30, 2013, at the age of 74. Each will read a favorite Heaney poem, and Irish pipes will be played. Singer Paul Simon will make a special guest appearance. The event will take place at 7:00 p.m. in Cooper Union's Great Hall and is free and open to the public. 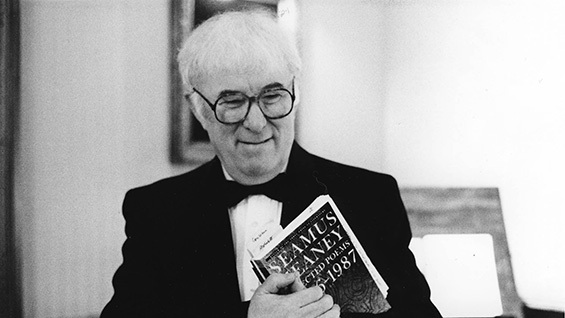 Born on April 13, 1939, in Castledawson in Northern Ireland, Seamus Heaney produced numerous collections of award-winning poetry and received the Nobel Prize in Literature in 1995. He was a Foreign Member of the American Academy of Arts and Letters, held the chair of Professor of Poetry at Oxford from 1989 to 1994, and taught at Harvard University, where in 1984 he was elected the Boylston Professor of Rhetoric and Oratory. The event is jointly organized by the Academy of American Poets, Poets House, Poetry Society of America, the Unterberg Poetry Center at the 92nd Street Y along with Heaney's American publisher, Farrar, Straus and Giroux. Cosponsors include Cave Canem Foundation, the Cooper Union for the Advancement of Science and Art, the Council of Literary Magazines and Presses, Irish Arts Center, Kundiman, the National Book Foundation, PEN American Center, the Poetry Project at St. Mark's Church, Poets & Writers, Symphony Space, Teachers & Writers Collaborative, and Urban Word NYC. Inquiries about the event should be sent to charif@poetrysociety.org.